Do you think this mod should be broken into smaller mods? Yes, but have an option for all features in a mod pack. 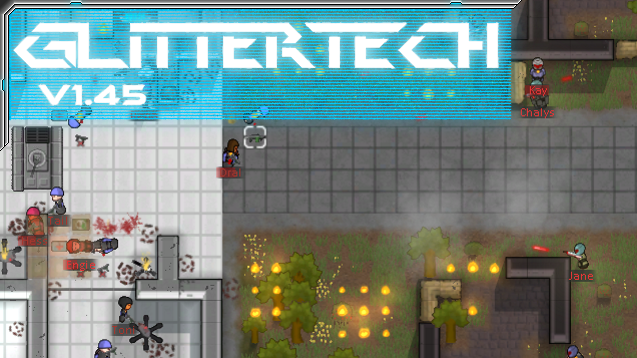 Glitter tech adds a number of advanced buildings, items and resources to extend gameplay and difficulty in the late game beyond what the game already offers. It is recomended that you start a new world to play the full Glitter Tech experience. This mod builds upon the existing information in the game that mentions glitter worlds. These worlds are presumably very high tech human societies with advanced production, communication and defense technologies. This mod adds the ability to produce and purchase more advanced items in almost every category. This technology attracts the attention of new factions hired to retrieve those advanced assets by glitter world corporations. Xeon-Ion generator placeworker is fixed and can no only be placed on a steam geyser. Computer components are now craftable by "sorting" components at the machining table. Improved surgery compatibility. This mod should theoretically be compatible most mods now. Replicators: Originally designed to annihilate the Mechanoids, these machines have self-replicated and updated beyond the control of the humans that originally built them. Orion corp defense weapons, and launcher. Changed: Black market trader is more balanced, and hopefully more common due to no longer selling slaves. Added: Two new epic materials: Alpha Poly and Beta Poly, both are extremely expensive, hard to craft and are supposed to be near indestructable building materials. Added: Robotic assembler. A new crafting station to create computer components, magnetic coils, and any new products in future. Added: Matter fabricator. A new crafting station to create very expensive materials, including the aforementioned Alpha and Beta polys. Note: This update is filled with untested and unfinished features in an effort to update to Alpha 8. GlitterTech version 0.8 will be the next major update, with planned features discussed below. Note: factions are created when the WORLD is created (not the colony) so new factions added will not exist in current saves. To experience the Commandos faction you need to either make a new world, or make the same world, using the same seed that your saves use, as this will over ride the factions in current saves and add any new factions. Credits go to Bodog999 for this solution. After a long wait I have finally gotten the time to update this mod. I'm planning a complete overhaul for this mod and I should hopefully add a ton of new features and rework the crafting systems. The general concept and the weapons or factions will mostly stay the same. If you have any ideas that you want to see in this mod then make a post, I consider them all. You are hereby encouraged to tear my mod end from end for your own personal use. But, ask permission before uploading any of my content. If adding this to a modpack you are going to distribute please ask permission and PM a link to the forum post. Since the beginning of civilisation the human race has been tilling soil to bring vital nutrients to the surface when planting crops. With this mod humanity in the year 5500 can too! 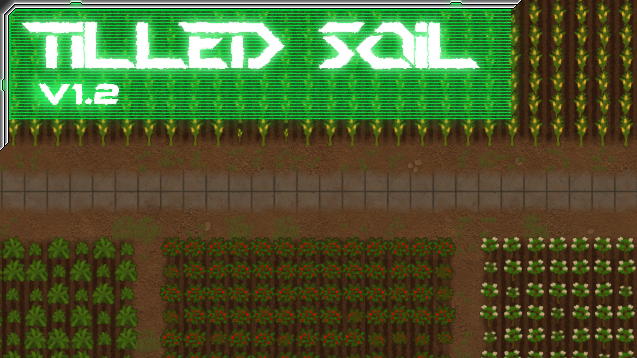 This mod adds a new flooring; tilled soil, which is a buildable version of fertile soil. In addition it adds research for terrain rehabilitation allowing you to build dirt onto smooth stone and other natural floor types so you can build underground greenhouses. 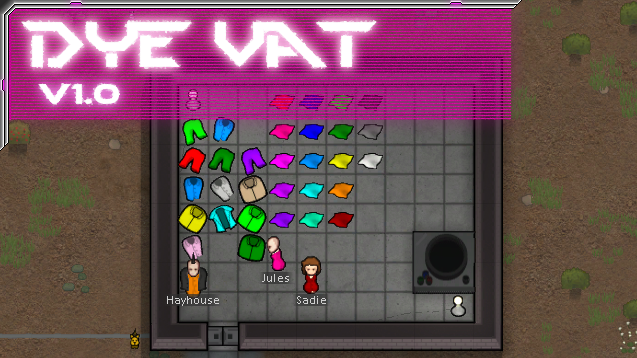 A simple mod that adds a dye vat to dye cloth into some bright colours. 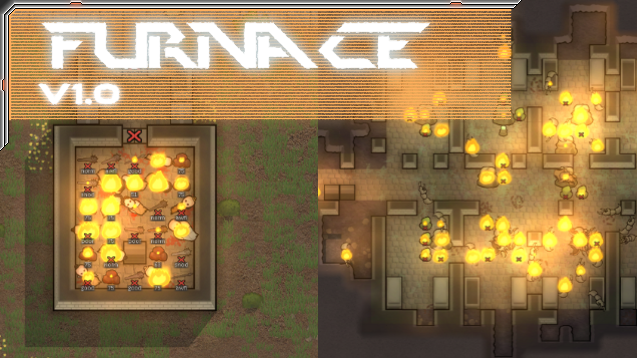 A simple mod that adds a furnace building to heat up rooms to extreme temperatures. You will have to be clever about allowed areas, doors and vents, it is very easy to accidently burn colonists and pets alive. 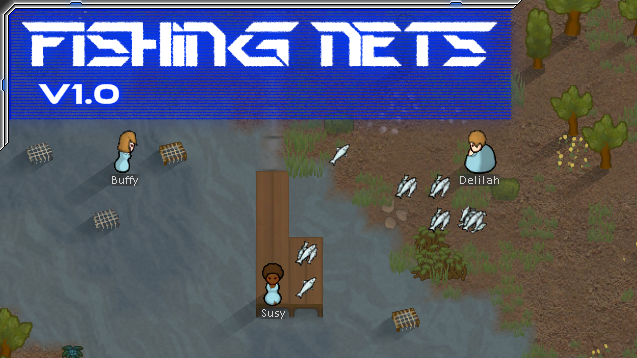 A simple mod that adds the ability to catch fish from rivers, lakes and oceans. There are several tiers of fishing nets that catch fish over time. Fishing nets also occasionally break, with basic wooden fishing nets only lasting a couple of days. In addition there is an option to build a fishing net on ice, to reap the benefits of the ocean under the ice. Yep, definitely giving it a try. Though I fear it'll be OP a bit- "Equiped with Electromagnetic barriers which will repluse most kinetic weapons fire." To beer or not to beer. That is a laughable question. That's just the description, there is no actual shielding implemented. After testing it a bit myself I think perhaps it might need to be buffed a bit. It's much rarer then other items, but doesn't improve stats much. A personal shield absorbing some damage sound fine, just the repelling all sounded bad. First shot with the rail gun, it blew someone's leg off. I love it. The armour looks pretty cool as well. Y'kno, I have one little itty bitty problem with this mod. That being that there's only a sniper-like weapon available. So at first I was going to ask if you could maybe make an assault rifle version or a heavy machine gun. Then I thought, screw it I'll make my own since he says we can do what we want. And thus my own first little modding attempt was created. I'll admit that it's nowhere near as original or great as yours, but I managed to edit the sound files, alter the textures and get everything working. I now have three awesome railguns to play with. a single shot cannon, a three round burst general purpose and a ten round burst suppression weapon. I haven't tested them for balance yet, but would you like me to put them up on this thread? I'd rather you made separate mod post with just your additions, but it's entirely up to you. That's just how my mod here started, by having a go at decimating some poor modders gun mod. Yeah, I was certainly going to implement a range of weapons to add to the collection, perhaps the latest in laser weaponry? And maybe a few rail gun turrets, see how I go. I have only edited the xml files for weapons, and haven't had time to test it thoroughly yet. If someone else could post here where they got the weapons from in their playthrough, that would help out. Otherwise there is only one variable in the xml files related whether traders have the weapon, and another defining the price. What about the armor? Where do you buy or get that?